Jerry and Cathy Sitek run UMN as a one-stop shop for precision grinding. 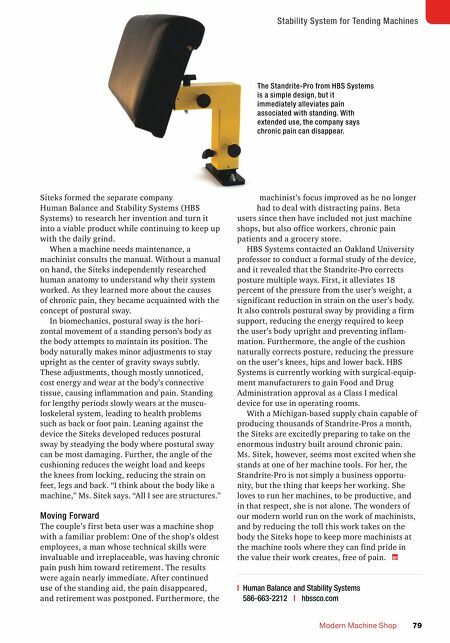 With Ms. Sitek's invention of the Standrite-Pro, the couple have formed HBS Systems to help other manufacturers overcome chronic pain. MMS MAY 2018 78 mmsonline.com ERGONOMICS AND HEALTH we couldn't find anyone skilled with the manual machines that are our specialty." As a one-stop shop for inner diameter, outer diameter, surface and jig grinding for short runs of special parts, the company gained a reputation for meeting demanding machining challenges, but the burden of 50 satisfied clients fell on Ms. Sitek. In terms of pacing and time management, keeping as many as three machines running at a time was easy for Ms. Sitek. However, with the increased physical activity, she developed chronic pain in her back and feet. "I tried every- thing," she says. "I did stretches. I put down f loor mats. I even changed my shoes three times a day." Nothing worked for her, which is far from unusual. 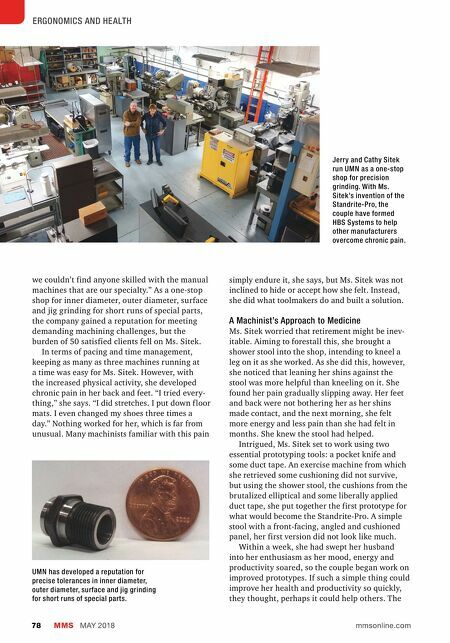 Many machinists familiar with this pain simply endure it, she says, but Ms. Sitek was not inclined to hide or accept how she felt. Instead, she did what toolmakers do and built a solution. A Machinist's Approach to Medicine Ms. Sitek worried that retirement might be inev- itable. Aiming to forestall this, she brought a shower stool into the shop, intending to kneel a leg on it as she worked. As she did this, however, she noticed that leaning her shins against the stool was more helpful than kneeling on it. She found her pain gradually slipping away. Her feet and back were not bothering her as her shins made contact, and the next morning, she felt more energy and less pain than she had felt in months. She knew the stool had helped. Intrigued, Ms. Sitek set to work using two essential prototyping tools: a pocket knife and some duct tape. An exercise machine from which she retrieved some cushioning did not survive, but using the shower stool, the cushions from the brutalized elliptical and some liberally applied duct tape, she put together the first prototype for what would become the Standrite-Pro. A simple stool with a front-facing, angled and cushioned panel, her first version did not look like much. Within a week, she had swept her husband into her enthusiasm as her mood, energy and productivity soared, so the couple began work on improved prototypes. If such a simple thing could improve her health and productivity so quickly, they thought, perhaps it could help others. The UMN has developed a reputation for precise tolerances in inner diameter, outer diameter, surface and jig grinding for short runs of special parts.